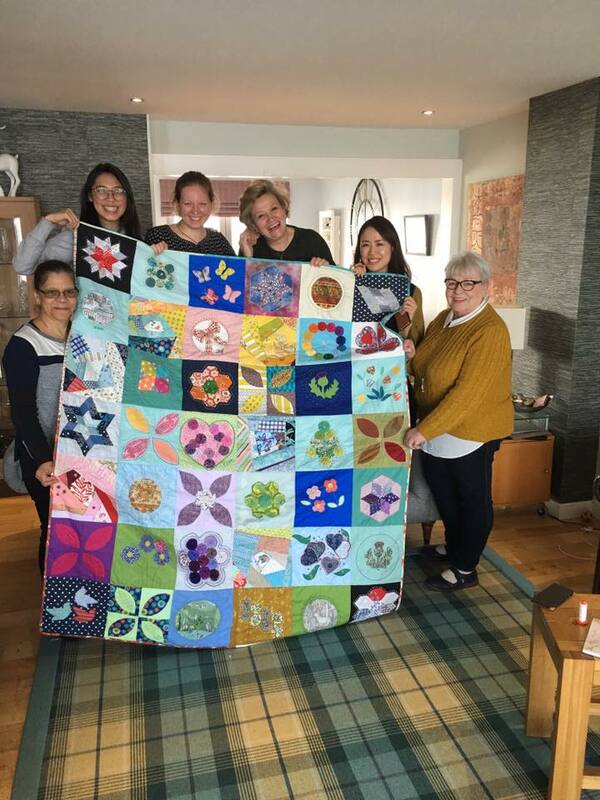 So here it is, our charity quilt to be exhibited at The Modern Quilt Guild's showcase event Quiltcon, made in aid of Alzheimers Scotland. This year, Quiltcon is in The Music City, Nashville, Tennessee. As a few of us like honky tonk bars and margaritas we are going this year, yeehaaa. 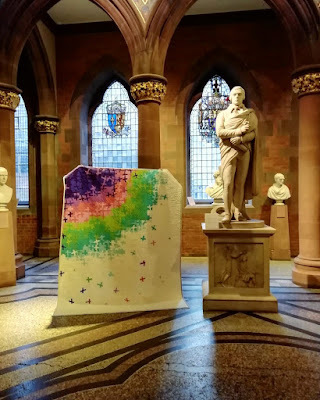 We were keen to have an entry exhibited since we are travelling over 3500 miles plus the colour pallet was particularly appealing this year. It evoked our very own Scottish heather clad hills, hey, maybe we should have followed that idea up!? We decided to get the most people as possible involved we'd go for A) use all the colours and B) a simple repeating block. 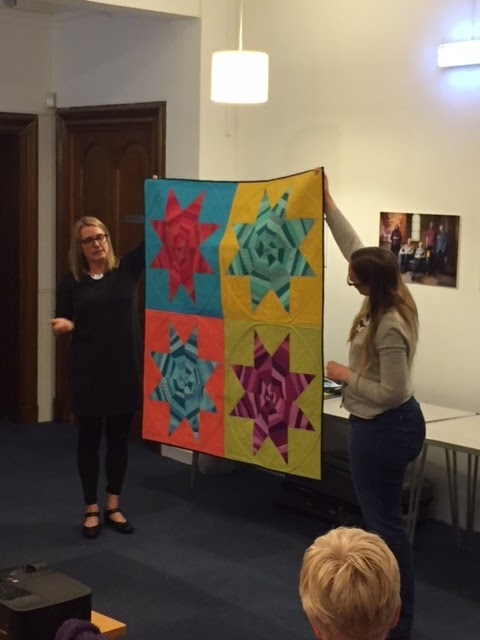 Some of the guild visited the Festival of Quilts and we made a (sewing)beeline for the wonderful Simply Solids (now closed) who did a great job helping us match the colourway with this gorgeous bundle. 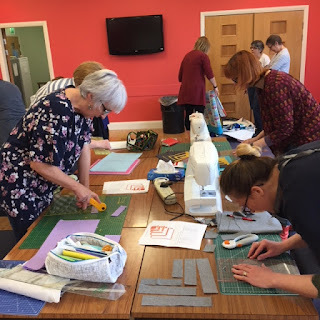 We scheduled our first sewing day, and it is a truth not denied that some of the team were nervous not having a pattern or anything other than a sketch to aim for. A secondary worry was small piecing. I was keen we all stretched ourselves and got something out of the process and hope we all had fun - even if I was treated like a victorian gangmaster 😇 I'm not the best at telling people what to do - honest! 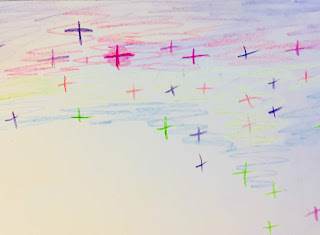 We organised ourselves into colour squads - purples, pinks, greens, blues each borrowing strips from the previous team which would create an overlapping colourwash - kind of... maybe. It was very much a let's see what happens. I'd calculated the need for 660 3" blocks, if we were to piece the whole top - this was not the original idea! We were going to piece the colour then have vast swathes of neutral space. As we built the blocks up it became obvious that 0.5m each of the colour was not going to be enough to do the colour across the top. So we changed direction to a radiation of colour from the corner. After sewing day number 1 it felt like we had over committed. Great progress but so many more blocks were needed. At this point we rationed out the Kona "Snow" and many great people wonkied that snow up a storm! There were fabric drops around the region and wonky crosses came back, so many wonky snow on snow - hundreds. 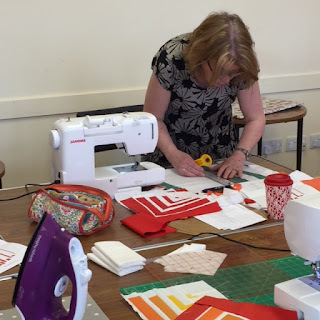 After the 2nd sewing day we got a lot pieced but the real challenge was bringing the last colour band in. The recurring challenge of not having a real plan was never having enough fabric! Half a metre of the pale blue just wasn't enough to stretch along the outline of the bloom (or planetary transact, or ovary, or explosion!). 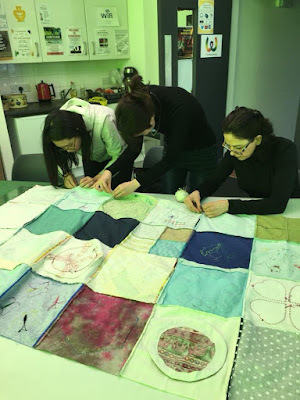 A couple of more short sessions saw these gaps disappear as if the quilt was growing unaided into the spaces. Finally, the lovely @mybearpaw Jo Avery let us finish the top in her studio - we needed the space! People dropped in throughout the day to fill the small gaps we had left and bring it all together into one very large flimsy! It was at this point we realised, erm, it wasn't wide enough - luckily we had all those snow blocks. So we added a couple of columns to the right landing at 720 blocks! At this point in Snow Wonky's recorded history I am redacting how badly I put the top together (picture above)! Suffice to say, it turns out if you have 719 blocks at about 3.5" (unfinished) and 1 block at 4.5" unfinished pieced into the centre of the quilt it doesn't work so well. There will be natural variation in seams, cutting, piecing when 24 people have contributed blocks. This gives you a challenge. But when one of your members is totally awesome and patient (if you didn't hear the swearing there wasn't any swearing right?) you do end up with an amazing finish. 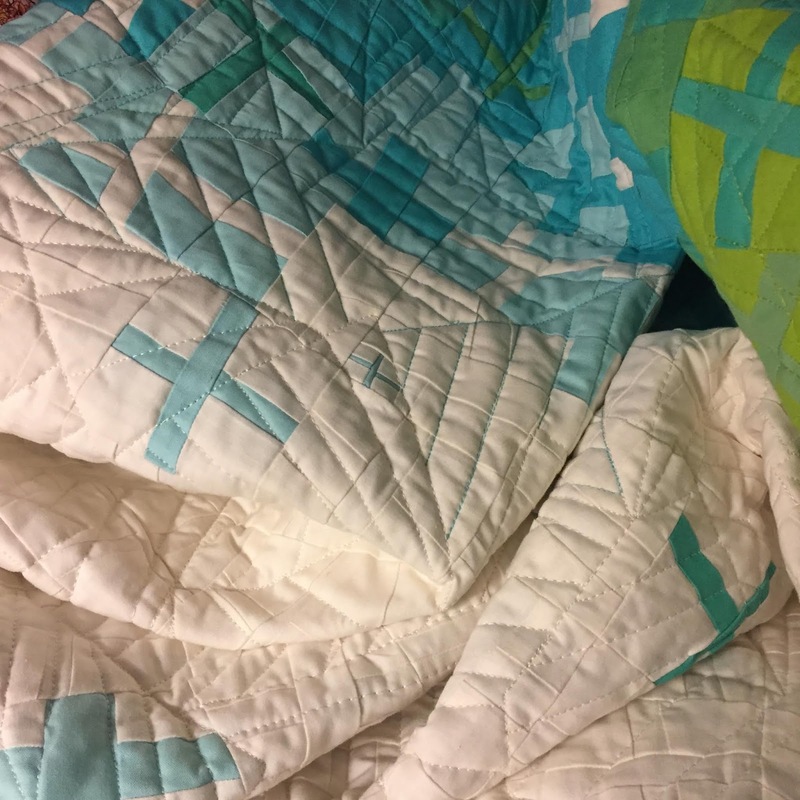 Thanks to @the_orriginal Kelly she brought order to the chaos, smoothed the wavy wonky wonder and quilted it into submission! So now Snow Wonky has landed in Austin, Texas to hang with the other wonderful Quiltcon Charity quilts. We can't wait to be reunited on the 21st February. c72"x90" in size - though I forgot to measure it! A shed load of Kona "Snow"
Over the last 12 months we have been involved in 2 local charities which should be highlighted due to the excellent work they do. 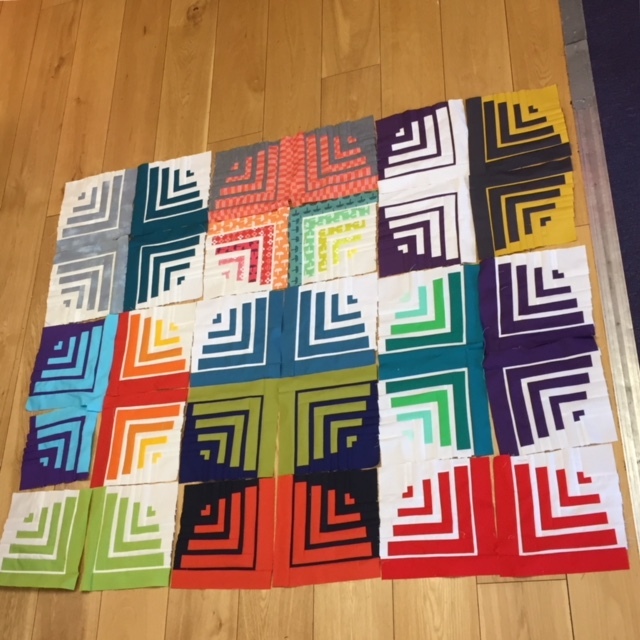 Back in the summer last year the EMQG joined up with the Augusta Modern Quilt Guild to swap 12" (finished) blocks using solids - we were to make a pair and we kept one and swapped the other. 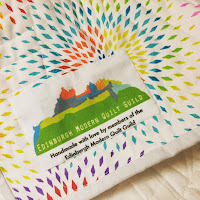 At the same time Jo Avery told the guild that MyBearpaw was to launch a quilt drive for the local charity SocialBite. Once the blocks were swapped and brought together we decided we should create quilts from the guild for The Social Bite Village. Two members, Mags and Pam, had a sewing afternoon were we raced each other (not really!) to create 2 tops. 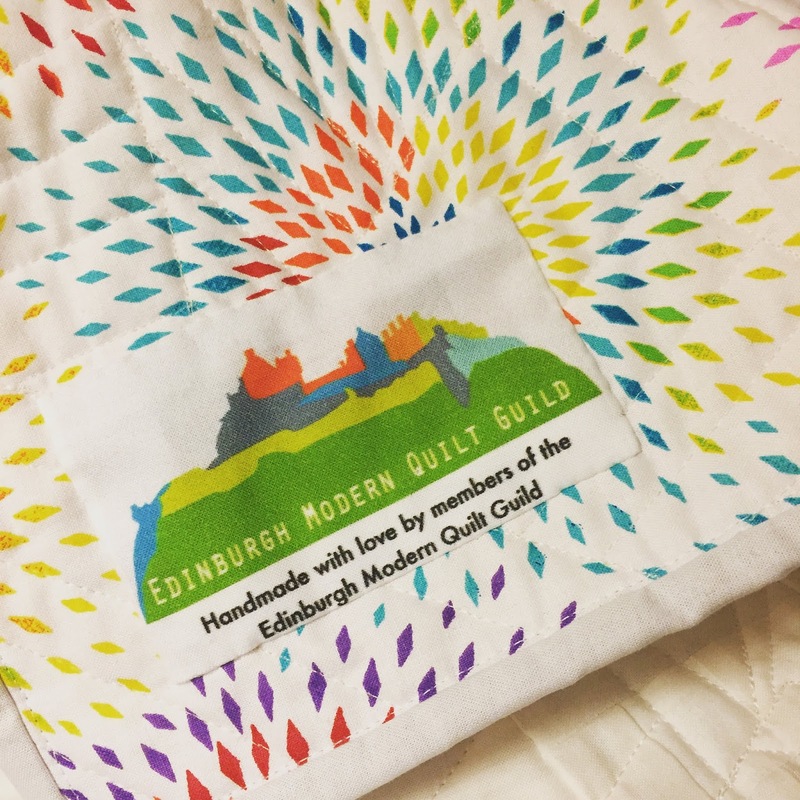 The second charity endeavour for the Guild started from a contact from Victoria who works with a charity called The Welcoming. They welcome newcomers to their events and activities to give people an opportunity to learn together and feel included in the local community, literally a welcoming. An amazing charity who do so many many diverse activities. 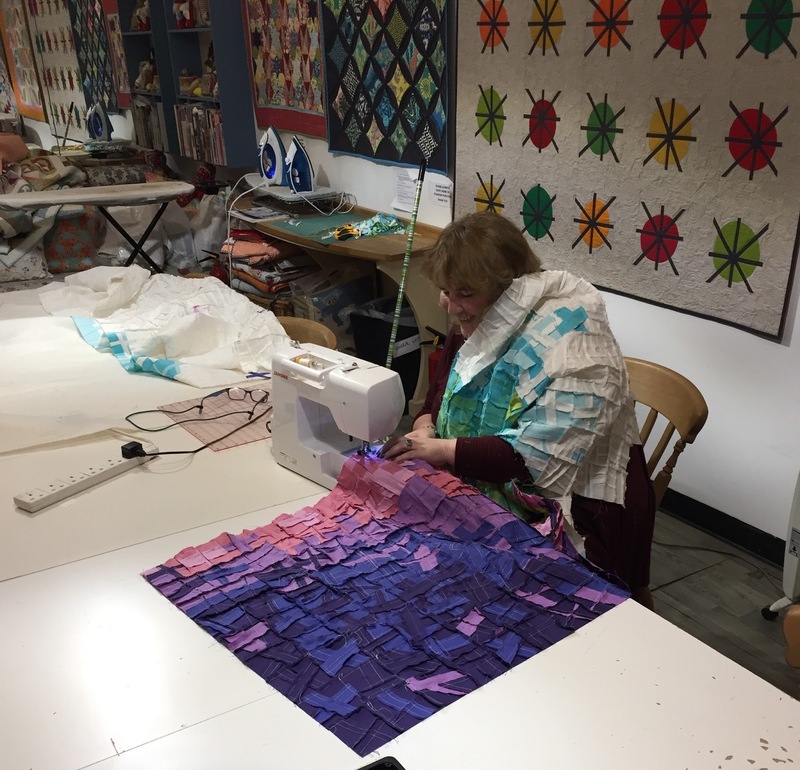 Victoria had an idea to start a sewing group in conjunction with their warmer homes initiative and naturally that lead her to quilts. 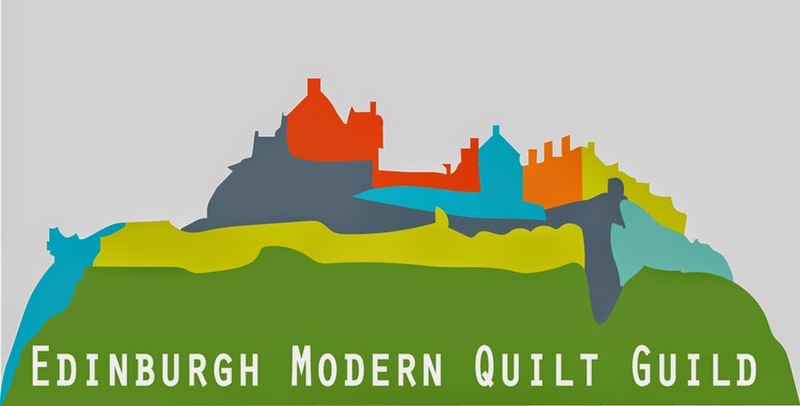 It also lead her to us at the Edinburgh MQG. 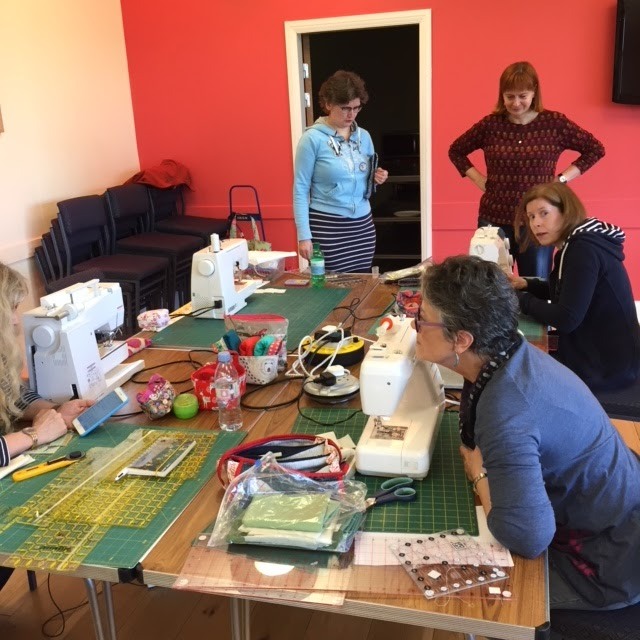 As a guild we collected together donated supplies, fabrics, some new some upcycled everything was welcomed, notions and even sewing machines. 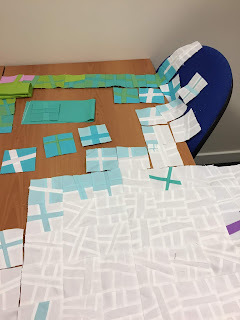 We focused on hand sewing initially English Paper Piecing (EPP) and hand piecing. 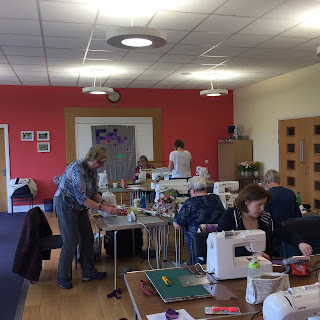 It was quite daunting, having made up little starter packs, we didn't know if anyone would turn up! We needn't have worried. The group formed from week 1. We started with threading needles, some had a little experience but others it was back to basics. After a single workshop on the 2 techniques the willing students jumped in and created. In the first term of drop ins people chose to make something they could keep, something pretty or useful or both! 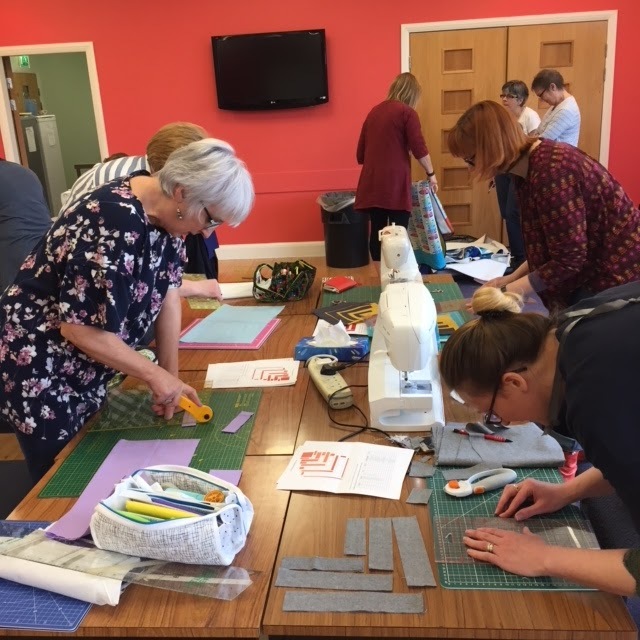 From upcycled jeans as the basis for tote bags decorated with EPP to a hand pieced cushion, every week we added new skills - embroidery, applique. After a Christmas break a number of the ladies returned and more joined. This time the group decided to work together, they had more confidence in their skills so ably lead by Mags, Ann and Suzanne they embarked on a quilt. Again, they learned new skills every week, but this time they made blocks which came together to make a beautiful sampler. The initiative was so loved that there are plans to run the drop in again after the summer break. 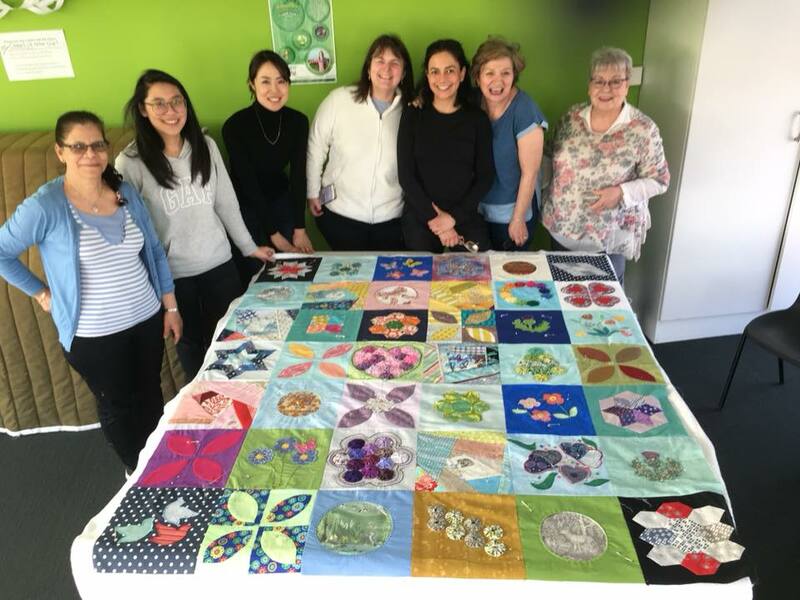 A final piece of news from the Guild, in May, the team who ran the drop in at The Welcoming were nominated for an award. To recognise how valuable volunteers are to society a partnership between Volunteer Edinburgh and The City of Edinburgh Council run a ceremony to award individuals, teams and charities for their work. 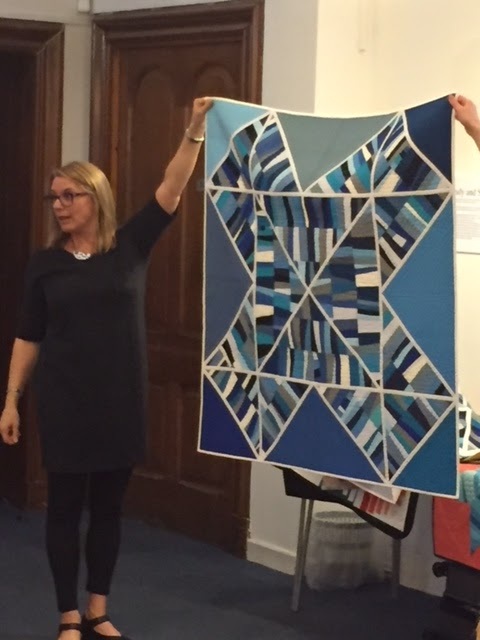 Victoria, who originally contacted us, nominated The Quilters for an Inspiring Volunteers award. We were successful and a couple of members (Mags & Pam (not the one named on the label, your blogger!)) happily received a certificate on behalf of the Guild group. So all in all, it is good to give. Whether that is supplies, inspiration, your skill, or your time it is appreciated. In early April we were lucky to secure time in Krista Hennebury's world tour. This blog summarises the evening lecture and the day workshop we truly enjoyed. 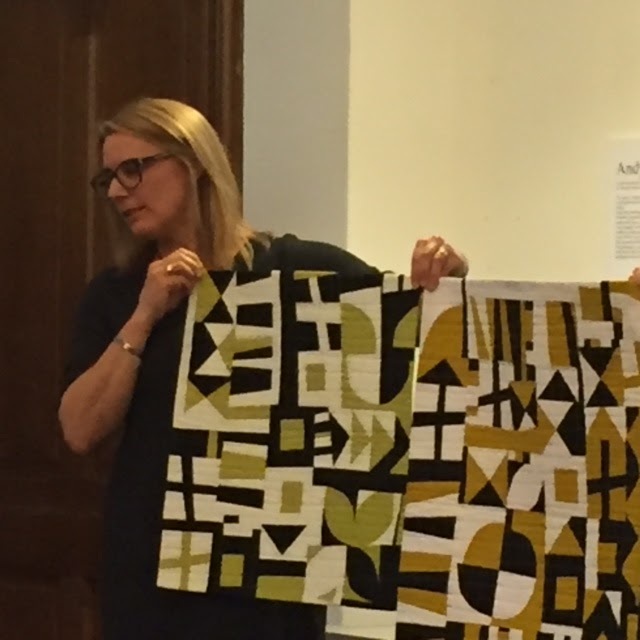 On the Friday we enjoyed a fun informative talk on inspiration. 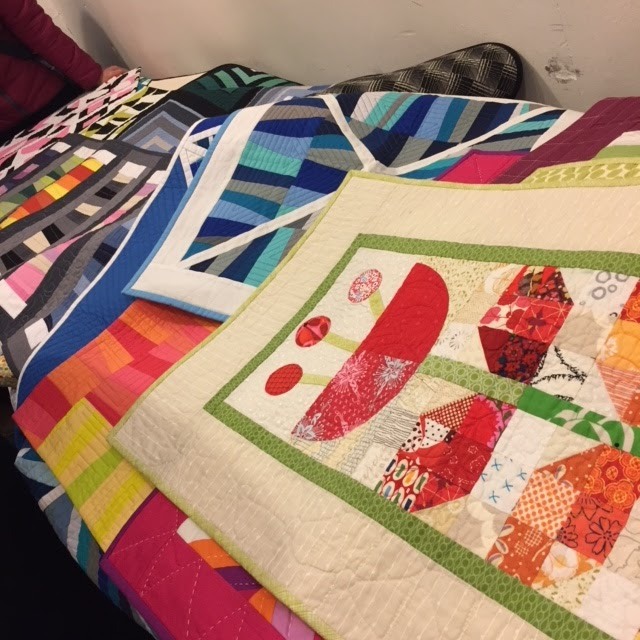 It was a great event as it wove a narrative of Krista's own quilty journey with an educational slant on how to challenge ourselves in our creativity. A cornucopia of exquisite quiltiness. Her travelling trunk of quilts is no mere cabin baggage, it's like there was a proper old school shipping trunk hidden away somewhere full of phenomenal quilty goodness! The talk itself was very well attended and we've had great feedback from those that joined the guild for the night. Your desultory author was so engrossed she didn't take enough pictures to do the event justice! Krista's style, or rather styles, is an intriguing spectrum of extreme improv and well planned precision that makes you stare open jawed at the discipline involved in the construction. 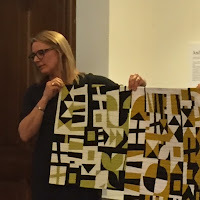 Your sporadic blogger can give you a taste of the content but better still if you have an opportunity to join Krista for a class or lecture - do it! 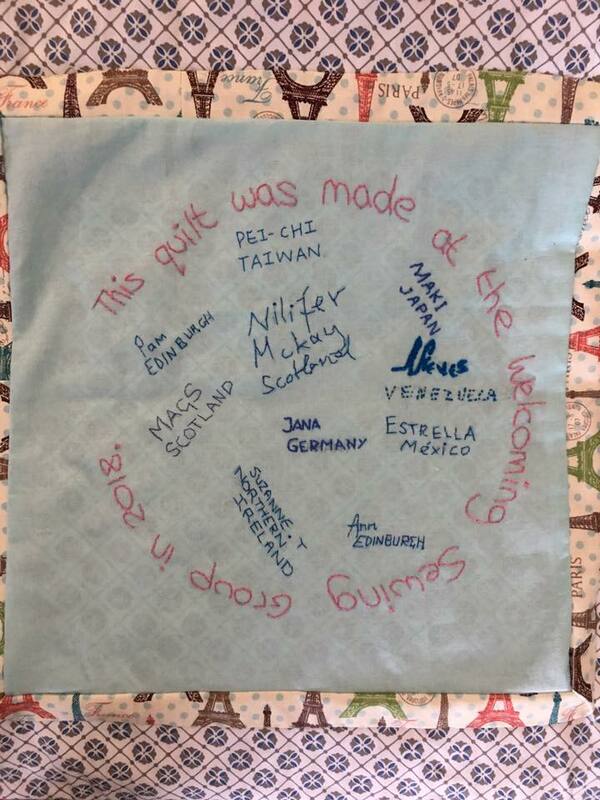 My personal favourite, as a fan of improv, were the speed dating quilts. 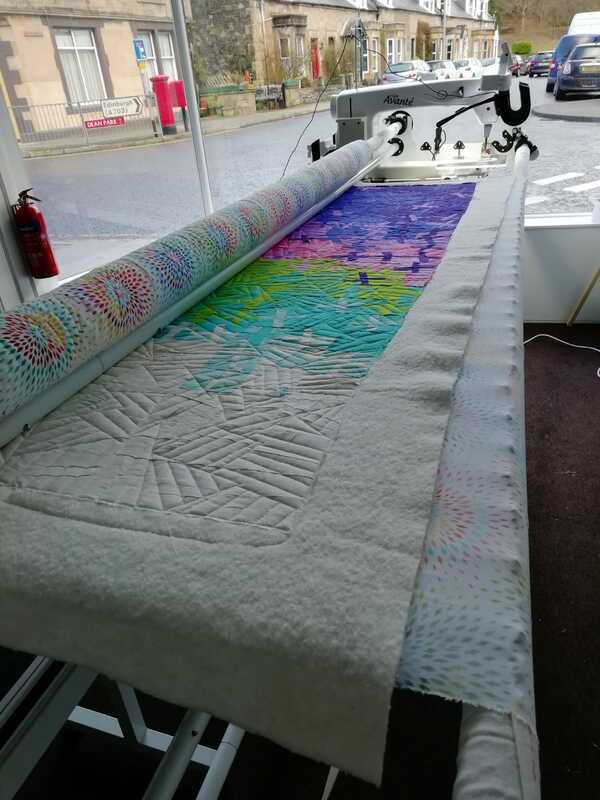 Krista's technique of limiting time and colour and forcing the owner of the rotary cutter to go at it with abandon is fantastic. For some, this is a real challenge. Is it the same as stripping down all convention and diving in - I need to stop with the verbose prose I'm making it sound like skinny dipping. Maybe it is of sorts? We also heard about the piano key method, which is an awesome mix of improv and structure. It reminds me of French gardens - wildness tamed by crisp box hedge edges. Moving along the precision scale we get to one of Krista's most iconic patterns, the square peg round hole. 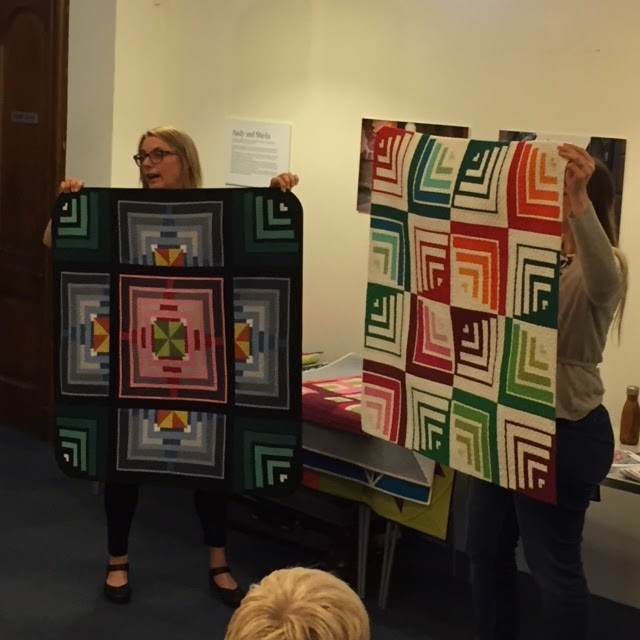 Can you believe that these 2 quilts are the same pattern? Nope neither can I. But they are! I'm not sure how many of us thought the Square Peg Round Hole workshop would be a doddle? It's just a log cabin after all.... Bahahaha! Nonsense. We started with a 1/4 inch seam tune up. 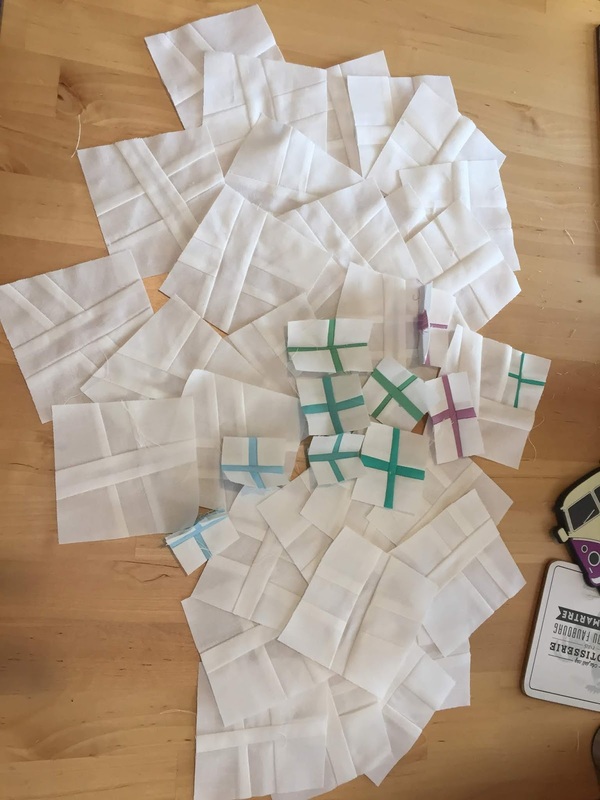 Have you ever tested your cutting, seams and pressing in one strip of squares? Your author hadn't - quite an eye opener! Turns out my tatty much abused ruler, my slashed cutting mat, my blunt rotary cutter and my even blunter needle may be holding me back?! So once we were all comfortable that we had rectified any of the above sins or atleast knew how to compensate, we were off! 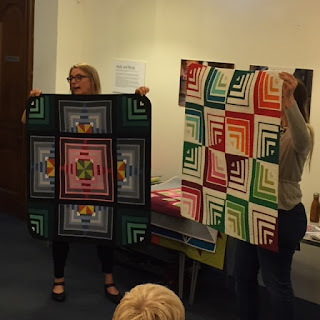 Some looking a bit worried that the quilt police are real! Until we all had a couple of blocks! I wish I'd nicked off with the lot! Don't they look great together. All in all we had a great time. A genuine feeling that we came away with new tips and skills to improve our precision. Thank you Krista for such an enjoyable weekend. If you've survived the first round up! In our second round up we will start with our November meeting. What a busy month this was. Starting with a Kate's meow (bahaha) these wee kitties were first up on the bee blocks. Heather's moody monochrome brings the storm at sea block together elegantly even though it looks like I was doing a handstand taking the photo! The big event in this meeting was the Improv Challenge. The guild set the challenge back in the summer to make an improvised mini quilt. There were no other restrictions and it is fantastic how varied they all looked. I think I have the correct name with the correct mini - kick me if I haven't! 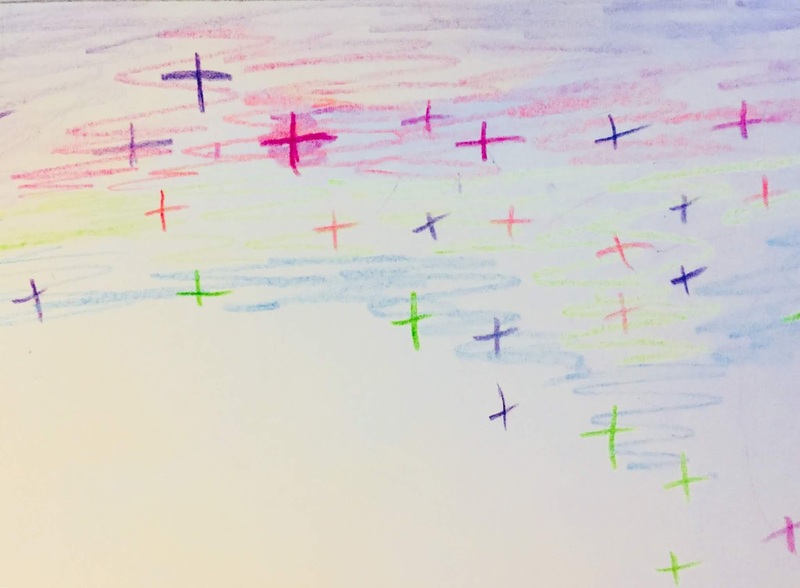 Helen's graphic improv draws you in. Love the quilting at the angle. Kate's Penguins waiting for Santa is perfect! Pam decided to take a literal approach in case it wasn't obvious she'd made it up as she went! 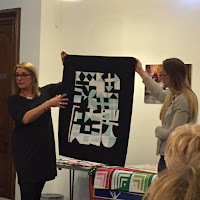 Fiona's crumb quilt oozes a Japanese richness, love it! Jo's tendril obsession continues with this lush low volume background and perfect pink leaf. this amazing impressionism effect - what do you see? 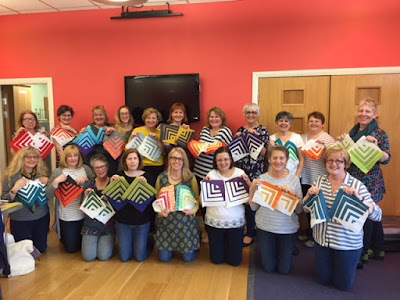 Mags sought inspiration in Fife. Well at least the view of it from her house. Audrey went free form curves and isn't that colour combo to die for? Sheena gave us a full on scrap fest. I love how colourful it is. During our wee cake break we had a ballot and Pam and Mags won the chocolates - well done! You'd think that would be enough for anyone? But no. Not the EMQG, we've still got WIPs and finishes! So do you remember last month's bee block? Margaret's tropical orange and lime delight? Well look what she did do with it! Amazing huh? She upcycled a jumpsuit and went for an HST throw. Clever. 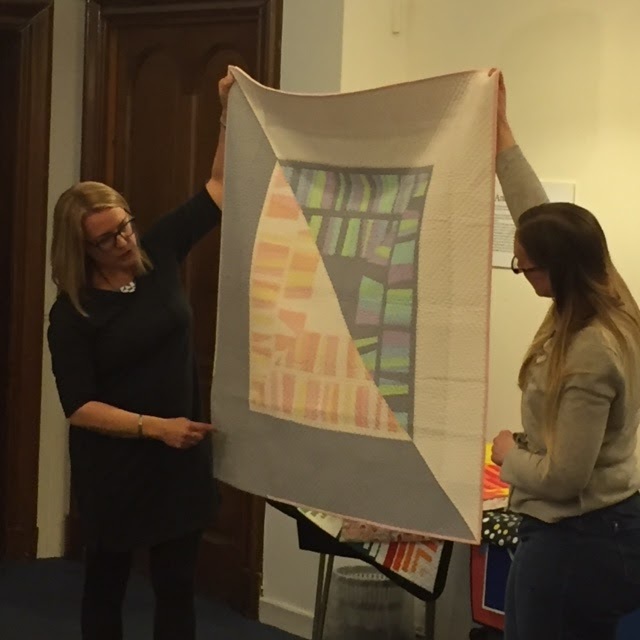 Another Michael Miller Our Yard Fabric Challenge from Kate who created this lovely project pouch. Now this is a delightful whopper! 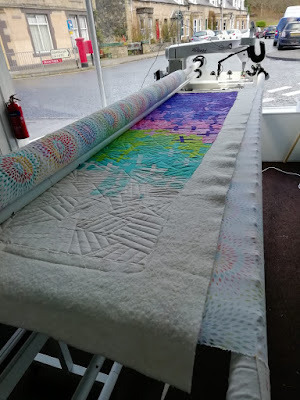 Angela's made this in a gorgeous array of pastels, not her go to array but my goodness it works and the wee girl who helped design it will love it for many years I'm sure. 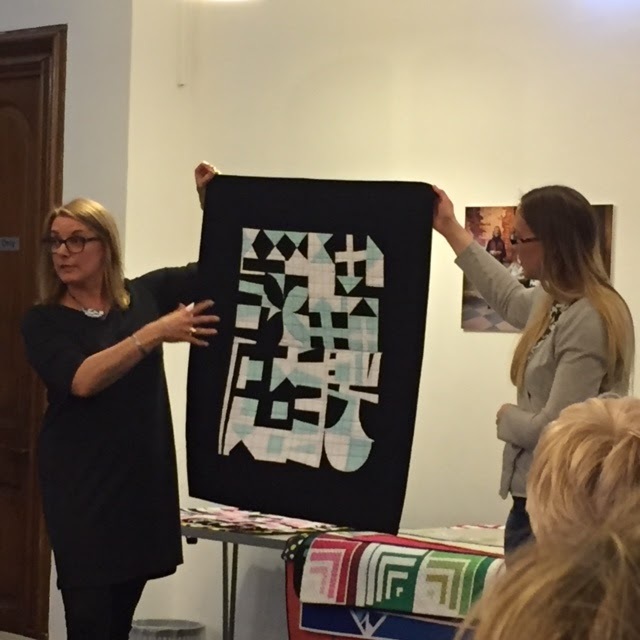 Sue showed her beautiful TartanKiwi zebra which will be resplendent on any wall! Now I think and I need to be corrected that these are Cathy, Ann and Fiona's rope bowls? I totally love these and they look so good together. Definitely need to make one or 10! Next up we have a few WIPs to add to the 2018 challenge. 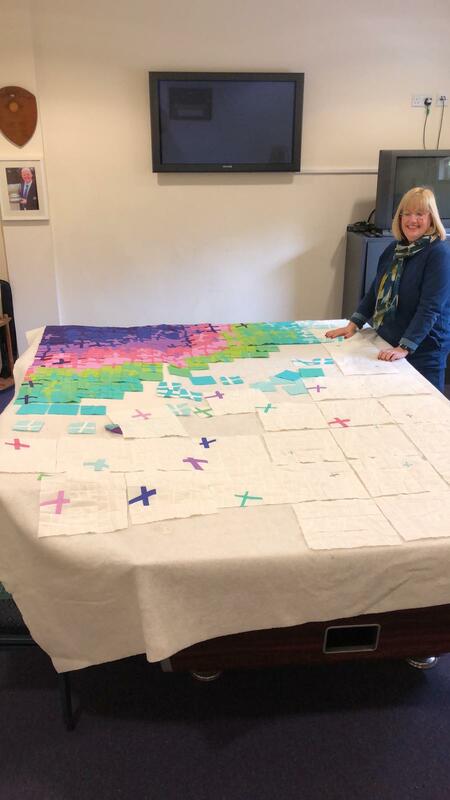 Ann's gorgeous squares is nearly there! 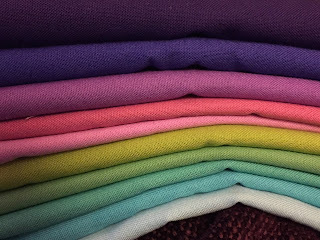 Madeline has two epic sew alongs to complete first her Jen Kingwell Long Time Gone top. And her Sarah Fielke Down The Rabbit Hole also near the end. Cathy also nearly there with this beautiful grid of loveliness! One from the Pappersaxten workshop from Cathlene. This is a great challenge! And hopefully doesn't live up to its name... Five Impossible Things. Kate has been on it! That's 3 makes in one meeting. 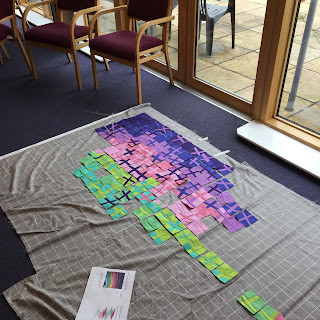 This constellation is destined for a charity quilt drive which will be publicised soon. This was our last full meeting of the year. 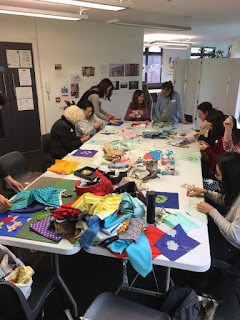 We continued to support The Welcoming teaching patchwork and quilting a blog is being prepared to show what we achieved in the first session of drop ins. I hope you agree that these busy talented ladies deserved a big night out? Well that's exactly what we did in December. We made each other a small christmas gift then ate and drank heartily! And that's all we are confessing to!